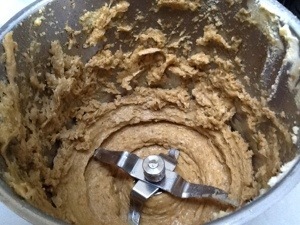 I don’t want to be mean or anything, but the Thermomix is no good at creaming butter. There, I said it. Fortunately this is not one of those recipes that requires light fluffy butter, this is another lunch box filler because the cupboard is bare Yet Again. The reason I’m using the Thermomix for this is because I’ve just made some butter, something that is becoming a weekly occurrence. Rather than wash the jug out, I just move on to making the biscuits, and I’ll follow that up with making raisin bread with the buttermilk. Such a housewifely morning I’m having, waiting for the StarTrak man to come and take away the remains of the epic party we had yesterday. I hope he comes before school pickup time. It mixed it well enough to be going on with. Now add a cup and a quarter of plain flour, half a teaspoon of bicarbonate of soda, half a cup of oats (I’m using the Honest to Goodness five grain mix) and half a cup of malted milk powder. That’ll cancel out the rapadura, the organic grains and the homemade butter. 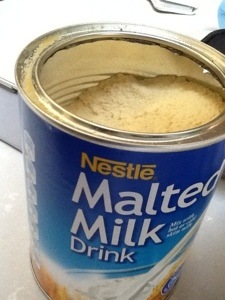 Actually, it doesn’t look too bad, it seems to be mainly powdered malt and powdered milk. I am still looking for a source of malt syrup, so one day this recipe will live up to my homemade ideals. Mix it all up. If you’re using the Thermomix, remember to put it on reverse, otherwise you’ll chop up all your oats. Blob large pinches of it onto a lined baking tray. They’ll flatten out. Bake at 160 degrees for about twenty minutes, or until they start to go golden. 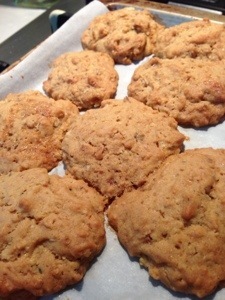 It makes a solid, flavoursome, slightly crunchy biscuit. I should mention that the recipe came from Donna Hay’s Modern Classics 2 book, but as soon as i get the malt syrup sorted, she’s getting no further credit.